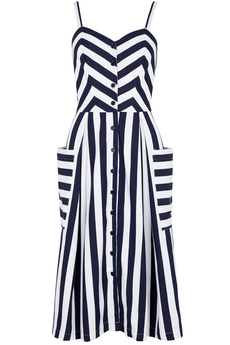 Layla Nautical Stripe Sun-dress is expertly cut with strategically placed seams at the bodice for a perfect fit adorned with button-down front fastenings, A-line flattering skirt with box-pleats and lovely oversized pockets at the side. This super stylish and easy-to-wear dress is finished with thin straps perfect for warm summer days. Is made from 100% cotton that feels luxuriously soft and is not lined and is approx. 112cm in length. New Summer 2019 Collection. Composition: 100% Cotton.